How cuts could provoke a Republican civil war. Now that Republicans in the House have beat back health care reform (or, at least, passed a repeal bill that's destined to wilt in the Senate), it’s on to the next order of business—hacking away at government spending. Plenty of them can't wait. As Arizona Rep. Jeff Flake said on Thursday, “Some of us have been anxious to start cutting for awhile.” No doubt. But the eagerness of some conservatives to cut the budget as quickly and deeply is already creating headaches for the GOP leadership. For starters, Republicans already differ over just how much of the budget to slash this year. Here’s the problem: Last December, Democrats passed a continuing resolution to keep funding the government at current spending levels until March. Republicans want to roll back this year’s budget to FY2008 levels, which would entail about $100 billion worth of cuts. Given that the fiscal year (which began in October) is nearly half over, and seeing as how Republicans aren't planning to touch Medicare, Social Security, defense, or homeland security, reaching that goal could mean slashing federal agency budgets by as much as 30 percent this year. That's not a tiny incision—we're well beyond “waste, fraud, and abuse” here. Democrats note that a 30 percent across-the-board cut would mean things like 8 million college students having their Pell grants pinched by an average of $1,000, or the Department of Agriculture scrapping 8,000 safety-inspection position. And some agencies could get wrenched particularly hard, since conservative allies are asking that their favorite programs get spared—the Chamber of Commerce, for one, wants highway spending left alone. That’s why, in recent weeks, Republican House leaders have been quietly edging away from their campaign promises. After GOP aides told The New York Times that the party might have to settle for less than $100 billion in cuts this year, House budget chairman Paul Ryan went on “Today”to blame Democrats for the GOP's dicey position: “We’re halfway through the fiscal year right now, so the problem is half the spending cats are already out of the bag, and that is why that number has become compromised.” In the meantime, an original draft of a spending resolution in the House Rules Committee had language that assumed a “transition to non-security spending at FY 2008 levels”—theword “transition,” of course, providing a little extra wiggle room. Naturally, this doesn’t sit well with hardened conservatives—or the Tea Party movement. 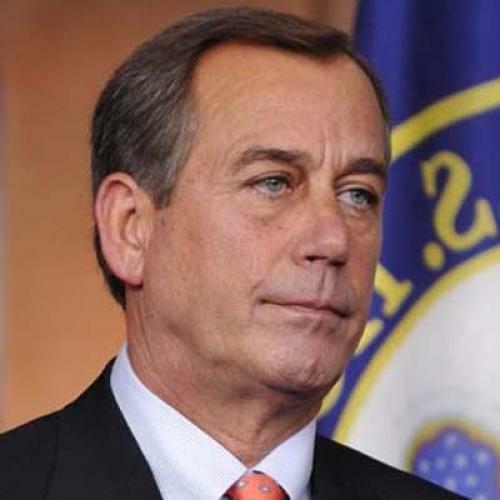 On Thursday, the Republican Study Committee (which acts as the ideological standard-bearer for the party), fired off a sharp letter to John Boehner, the Republican Speaker of the House, warning him not to get all weak-kneed on them: “Despite the added challenge of being four months into the current fiscal year, we still must keep our $100 billion pledge to the American people.” And, at a Rules Committee hearing on Wednesday, freshman Representative Tim Scott—a Tea Party favorite—managed to scrap all that wishy-washy “transition” language in the (largely symbolic) spending resolution. So it’s no wonder that even the cut-happy vanguard at the RSC presser got defensive the more they were questioned about the cuts. After a query about the $1.39 billion proposed cut to the USAID budget—because didn’t Defense Secretary Robert Gates recently say that foreign aid was a crucial part of national security?—Jordan said, “We have to make sure the country’s safe. … But, again, the situation is so bad, everything should be on the table.” Another concern: Wouldn’t a rapid cut in spending cause more layoffs—and thus worsen unemployment. Jordan’s airy response: “We think if you reduce federal government spending, you actually create jobs.” (Okay, but even if you believe that’s true in the long run, in the short term, that’s a lot of federal workers out on the street right while unemployment's still high.) When New Jersey’s Scott Garrett was asked if it was really so wise to cut spending for, say, the Securities and Exchange Commission, which has often claimed that it lacks the staff to regulate the financial industry properly, he just scoffed: “Don’t you find it ironic that these agencies that failed to do their job are now asking for greater authority, larger personnel, and more budget?” It wasn’t clear what the irony was. In other words, conservatives haven't quite worked out all the kinks. And, in the meantime, Republican leaders haven’t figured out how to balance the zeal of their right flank with the the headaches involved in getting those cuts to stick. Sure, Jordan said he was “optimistic” that the GOP leadership would take up the RSC’s recommendations, and House Majority Leader Eric Cantor “applaud[ed]” the committee’s proposal. But, underneath all the happy accolades, there’s still plenty of room for ugliness.